I saw this Cookie Cutter Fudge Recipe at BettyCrocker.com and thought you all would like it, too. It's such a cute idea and sounds really simple to make. I think this would be great for homemade Christmas gifts for family and friends. Who doesn't like fudge? 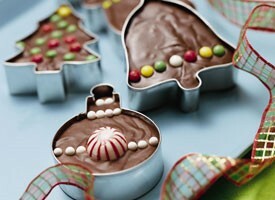 Place each holiday shaped cookie cutter on a square of foil. Seal the foil tightly around the outside and place on a cookie sheet. Lightly spray the inside of the cookie cutter with cooking spray. Combine chocolate chips, peanut butter chips, milk and butter in a medium saucepan or microwave safe bowl. Melt on low heat, stirring until completely melted. If using the microwave, heat uncovered on high, stirring every 30 seconds. Do not overheat. Pour mixture into cookie cutter molds, filling to tops of molds. Refrigerate uncovered about 2 hours or until firm. Decorate with icing and candies. Carefully remove foil. Gently press fudge out of molds to serve. If you want to use the cookie cutters and fudge for gifts, leave the fudge in the cookie cutter and wrap with cellophane or place in cellophane favor bags and secure with a holiday ribbon. You can find the cello bags at Candyland Crafts. I hope you enjoy this recipe as much as I did! I can't wait to make it.